The sun sets during "Manhattanhenge" on July 13, 2011 in New York City. Manhattanhenge, the phenomenon of the sunset aligning precisely with the grid of streets in Manhattan, happened at 8:17 p.m. Tuesday, but it wasn't visible to spectators who'd hoped to catch a glimpse of the stunning view. As the tri-state area faced severe weather, clouds blocked the view of the grand sunset. 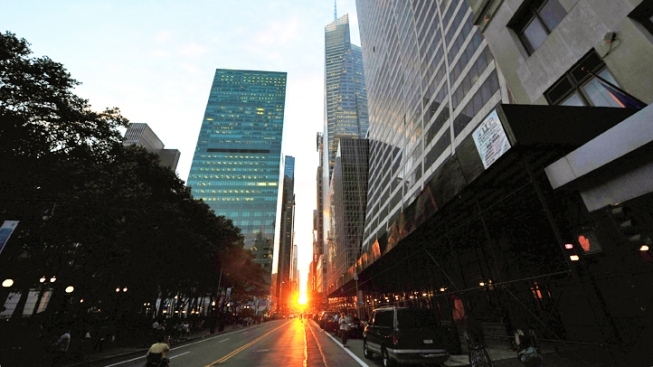 "Manhattanhenge was a #FAIL," lamented one tweeter. "#Manhattanhenge drawing crowds but ultimately an eerie disappointment," wrote another. On a clear day, the typical resulting effect of Manhattanhenge is a "radiant glow of light" across the skyscrapers and buildings, "simultaneously illuminating both the north and south sides of every cross street of the borough's grid," according to the Hayden Planetarium website. But maybe sun-gawkers will fare better the next time around: the next Manhattanhenge -- with half the sun on the grid -- will occur Thursday, July 12 at 8:25 p.m.
Manhattanhenge with the full sun on the grid happens Wednesday, May 30, at 8:16 p.m. and on Wednesday, July 11 at 8:24 p.m.
Show us your Manhattanhenge photos by uploading them here, tweeting us at @NBCNewYork, or uploading them on Instagram with hashtag #NBC4NY!